There are great quantities of wild sheep of huge size. Their horns grow to as much as six palms in length. 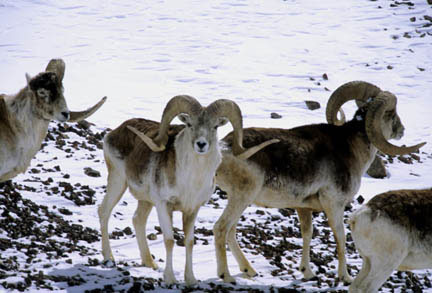 Tajikistan’s Pamir Mountains are home to snow leopards, the scimitar-horned ibex, and the world’s largest wild sheep, the Marco Polo sheep (Ovis ammon poli), first described by the famous explorer of Central Asia. The Murgab District lies in the remote far eastern portion of Tajikistan. The landscape ranges from vast flat valleys at 11,500 feet to the Pamir peaks which rise to more than 16,500 feet. This high-altitude desert gets less than 3.6 inches of annual precipitation. In 2010 we partnered with the National Trust for Nature Conservation, and opened a Snow Leopard Conservation Project office in Kathmandu. Activities that promote improved local livelihoods and natural resource management within the current free market system were implemented as the Pamir High Mountains Integrated Project. Under a grant from UNESCO, the French Agency for Technical Cooperation and Development (ACTED) lead the project, assisting local people to develop community-based tourism opportunities. 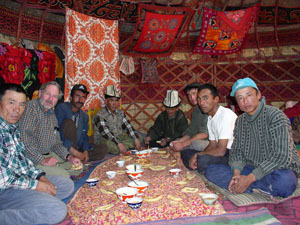 In 2003 at ACTED’s request, Rodney Jackson conducted a reconnaissance visit to Tajikistan in July 2003 to examine opportunities for promoting wildlife conservation and community-based monitoring in the eastern Pamir mountains. [Photo: RJ in mtg] He trained local staff and herders in basic survey methods for monitoring snow leopard and Marco Polo sheep, based on valley transects. 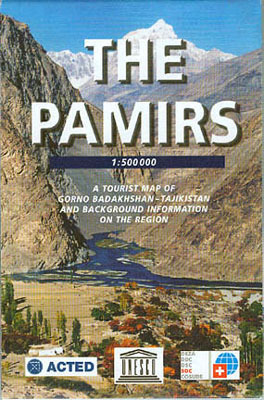 The following year the The Snow Leopard Conservancy provided information for the first tourist map of the Eastern Pamir Mountains of Tajikistan, as part of a long-term project aimed at linking wildlife conservation through community-based tourism and income generation. Mr. Mamadiev Ubaidullah, manager of the Murgab Ecotourism Association (META), and nature guide Turdukulov Janazak traveled from Tajikistan to Ladakh to exchange with SLC-India ideas and lessons learned on Homestays, nature tourism and the monitoring of rare wildlife such as snow leopards, blue sheep and Marco Polo sheep. You may read more about this project. With two grants from The Christensen Fund, the Snow Leopard Conservancy and its partners launched a detailed project to strengthen biodiversity conservation in Tajikistan, especially in regard to snow leopards and Marco Polo sheep as keystone species for the Pamir mountain ecosystem. 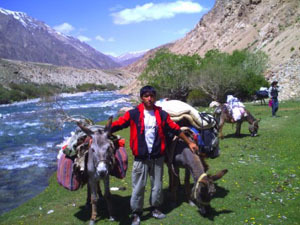 The grant supported field trips, training workshops and community enterprise grants between 2005 and 2010, targeting communities in both the eastern and western portions of the Pamirs. These project reports contain further details: Mountain Cultures & Keystone Species, and Mountain Voices & Community Actions. We also provided grants to the Murgab Ecotourism Association (META) to hold training workshops. 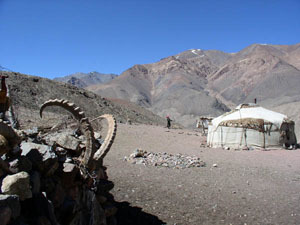 In 2010, the first addressed homestay provision in two valleys of the Pamir. About twenty households and representatives from local government and the Nature Protection Department participated. A key objective was the institutional strengthening of the local Conservation Committee. Participants developed plans linking biodiversity conservation with ecotourism to bring socioeconomic benefits to local people. They envisioned a system of traditional yurt Homestays, guiding services for horseback treks, and jeep tours. The second training addressed surveying key wildlife populations, locating snow leopard sign, identifying hotspots for Marco Polo sheep and ibex, and raising awareness regarding the interrelationships with wildlife, livestock husbandry, and local people’s welfare. Sixteen community members participated, along with representatives from the Wildlife and National Parks Department. Tourism guides were assisted with opening new adventure travel routes. Two students are receiving English language training. Hot spring improvements were initiated, but washed out in region wide flooding. Brochures and posters were distributed to hotels in Khorog and tour operators.